Take a look at our quick start guide for simple setup. Below is the complete documentation for the client. 18. What password to use? 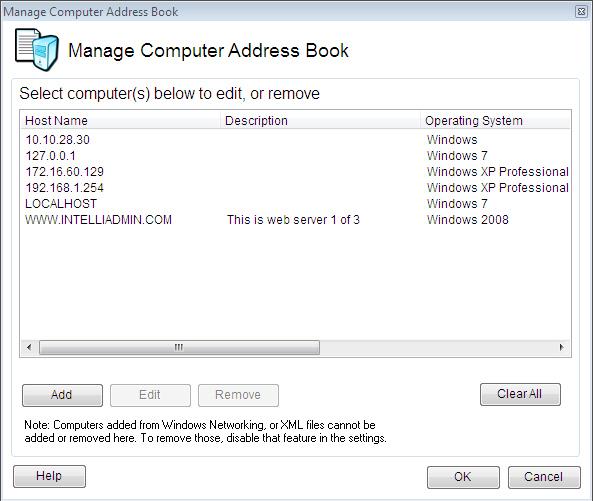 To connect to a remote host, type its host name or IP address in the connect window, and press connect. To connect successfully, the server software must be already installed on the remote side, or file and printer sharing need to be properly configured to allow an automatic server installation. 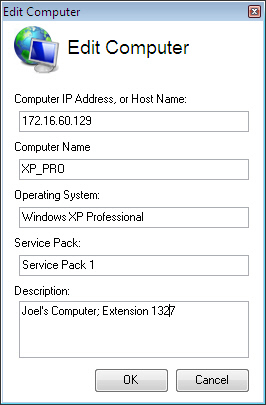 Sometimes you may have a server that is configured to listen on a port other than the default 2792 (TCP). 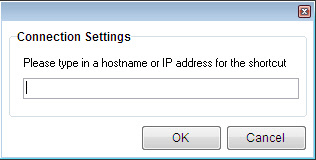 If this is the case, you can specify a port by placing it after the host name with a colon. -Your password must be set. Blank passwords will be denied. 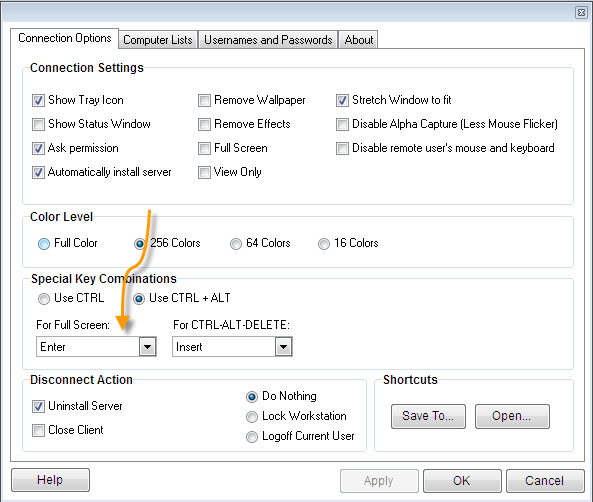 -File and printer sharing need to be properly configured, and opened in the firewall. Security features in newer versions of Windows like XP SP2/3, Vista, and Windows 7 may prevent automatic install from working properly. To remotely install, an exception for file and printer sharing needs to be made in the firewall. 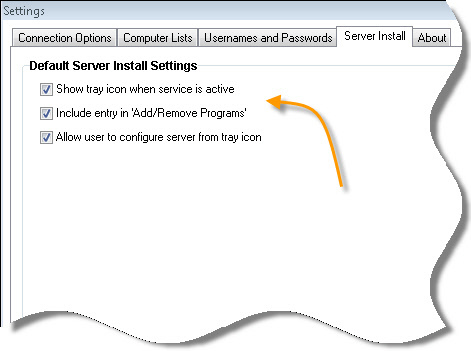 -Disable/Enable displaying the server application in ‘Add/Remove’ programs on the remote machine. 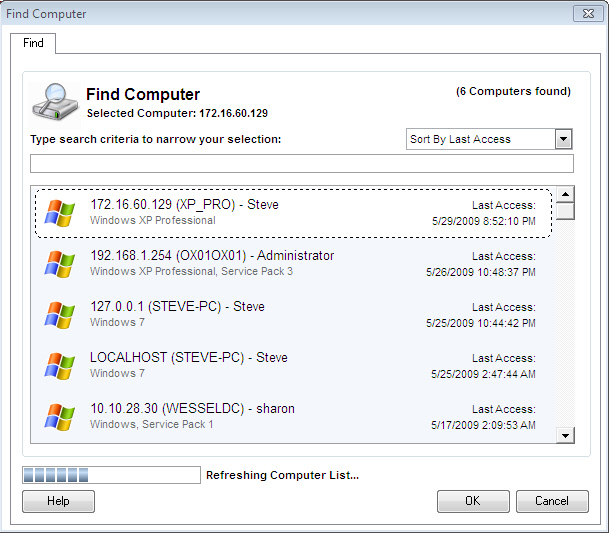 The computers that are shown in the find window can be pulled from a number of locations. 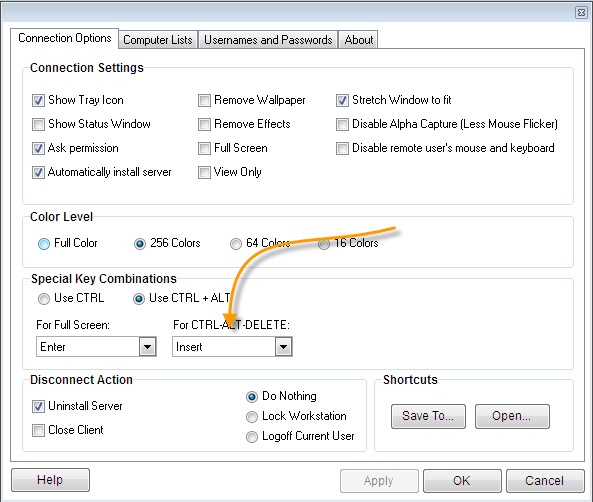 All of these options are in the settings window, under the Computer Lists tab. 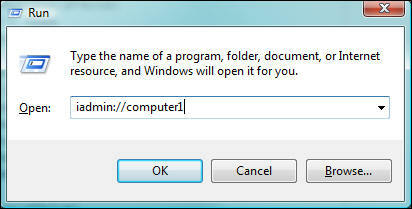 Note that other information like the operating system, and username are not provided in the XML file. This is because this information is sent automatically by the server to the client. Keep in mind, it will take at least one connect before this information will appear. 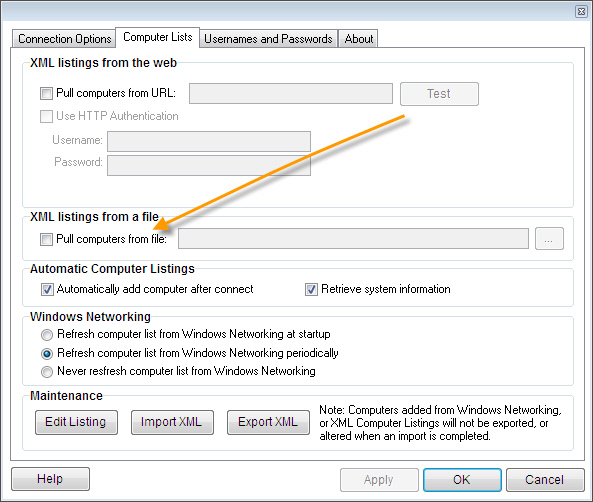 There are a few different ways an XML file can be used to pull computers for the find window. The first is via an HTTP, or HTTPS XML URL. You can specify a web URL that returns XML in the format shown before. 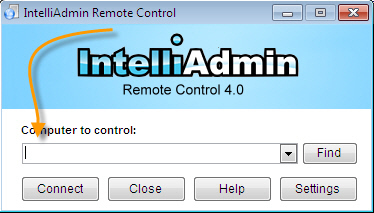 The remote control client will check this URL for changes every time the user clicks the find button. 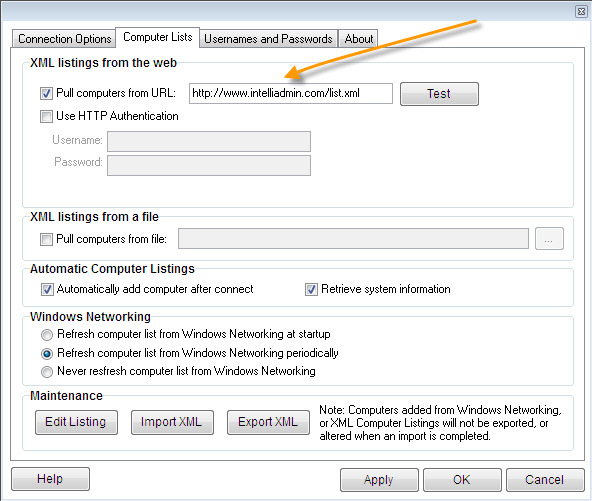 Once you have entered a URL, you can click on the test button to make sure it works properly. The HTTP URL field supports HTTP, and HTTPS. 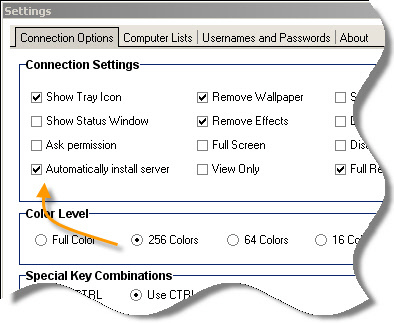 Internet Explorer settings are used to determine proxy values. If you want to backup your listing of computers you can export the entire list as an xml file. Just click on the “Export XML” button. 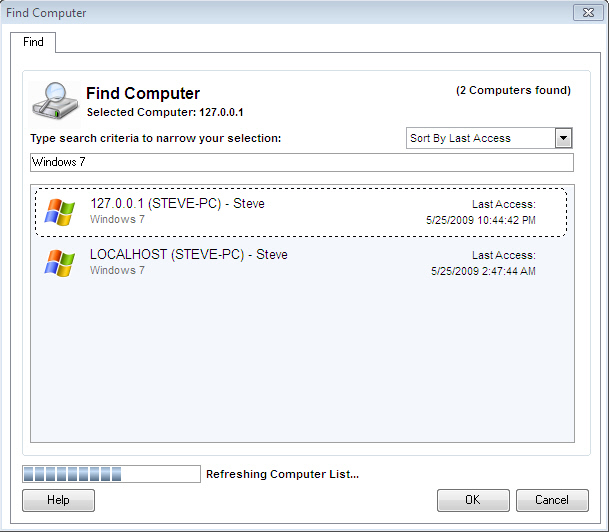 Computers in the find window can be edited. Two exceptions to this are computers pulled from a HTTP/HTTPS XML URL, and XML Files. Those cannot be edited, and the XML file or URL must be updated to make a change. 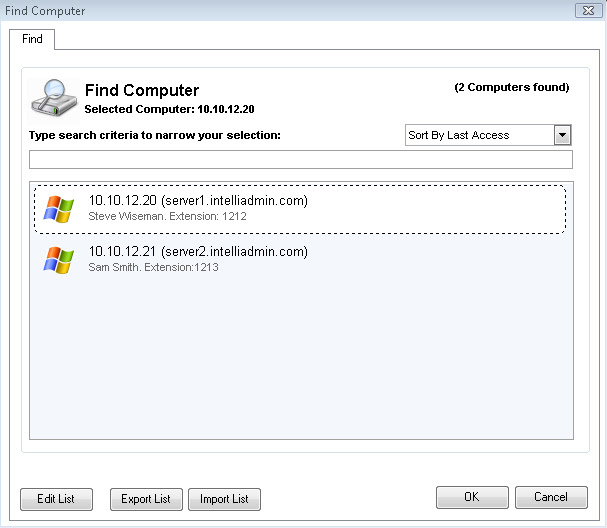 Note that all of this info is quickly search-able in the find computers window. 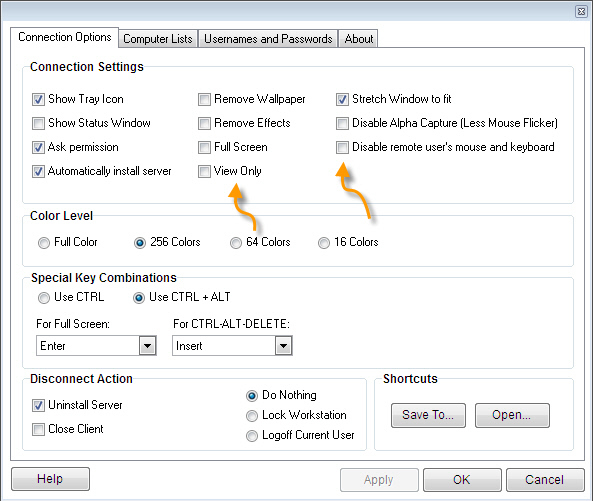 So in the above example I could simply type the users phone extension 1327, and their computer would be instantly brought to the top of the list. The client will search XML, and Windows networking hosts in the background so you don’t have to wait. The client will also cache this information so once it has loaded, the old information will be there until an update has completed. 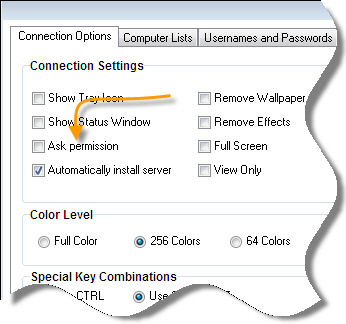 You can force a user to request permission before connecting by changing user settings on the server. See the server manual for more details on how to do this. 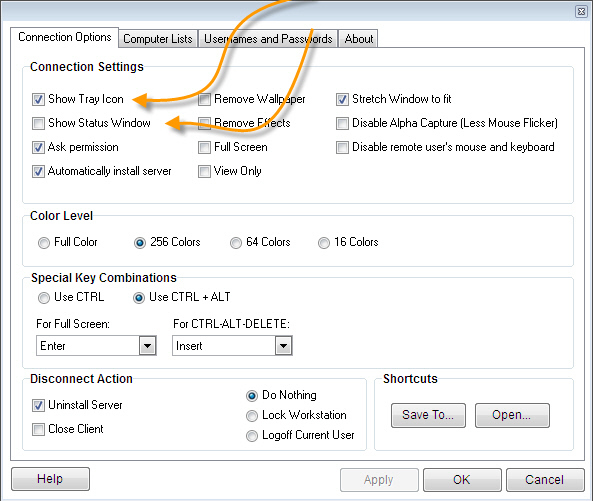 These settings can be enforced by making changes to the agent user account. See the server manual for more details. 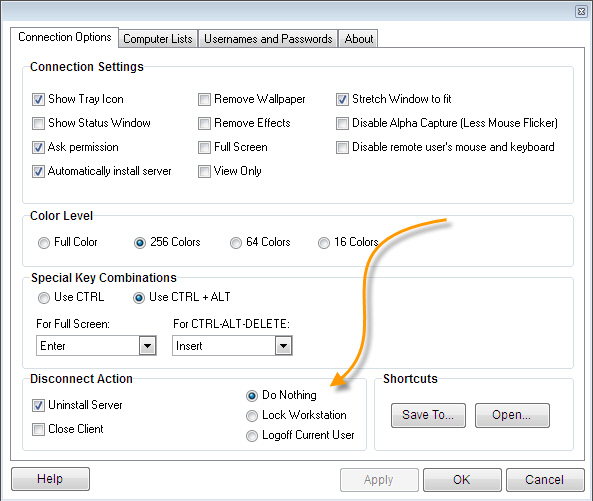 Force the workstation to lock, or force the session to logoff on disconnect. 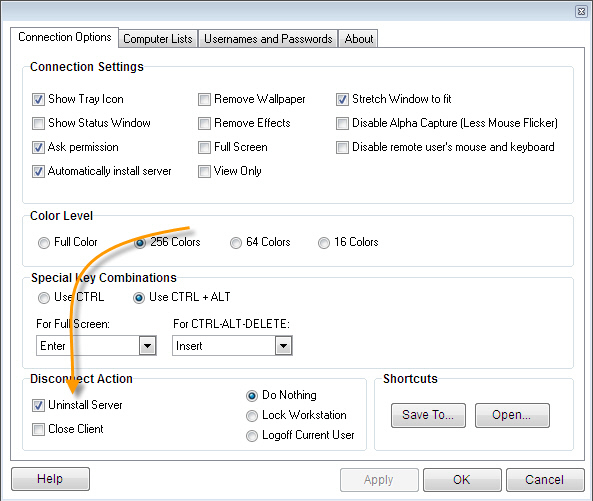 settings you prefer and clicking the “Apply” button. 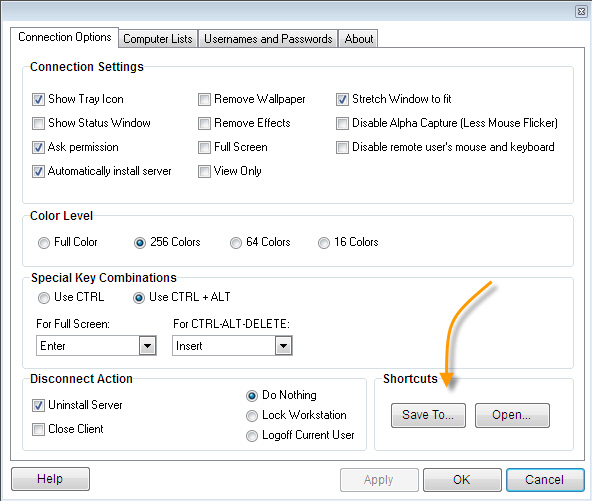 If you want to create a shortcut with custom settings, pick the settings you would like, go to the shortcuts tab and click on the “Save As” button. 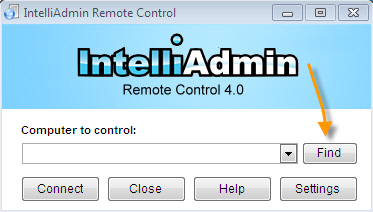 Settings can be passed to Remote Control in two ways: Via a URL, or from the command line. 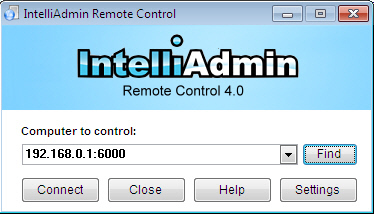 Once you are connected to the remote host, you can tell the viewer to stretch the current window to fit. This helps when the remote host has a screen that is much larger. 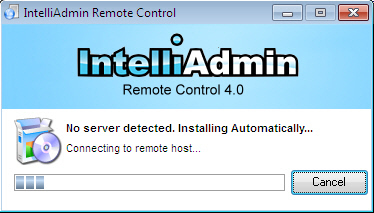 -The remote machine is not running the IntelliAdmin Remote Control Server. If a firewall is blocking the connection, you will need to make sure TCP port 2792 is open for listening on the remote host. If you are using windows accounts for authentication, make sure the username has a password or it will reject it for security reasons. 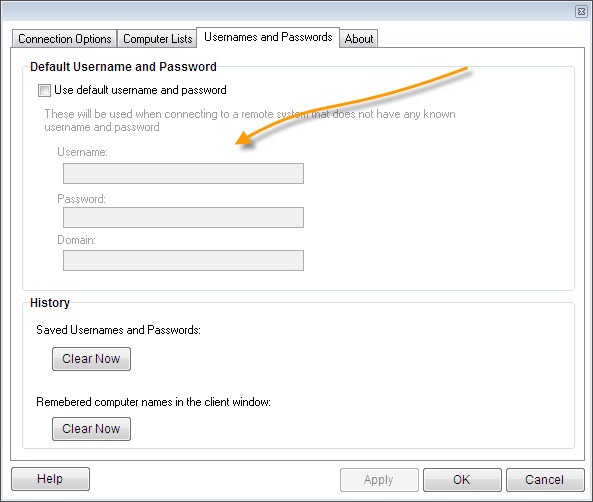 The password is stored in an encrypted format in the registry. 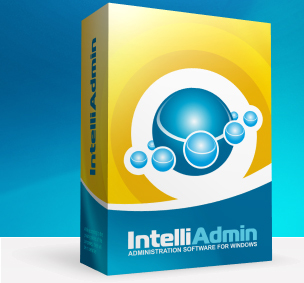 If you still have any questions please feel free to send us an email at: support@intelliadmin.com and we are glad to help.